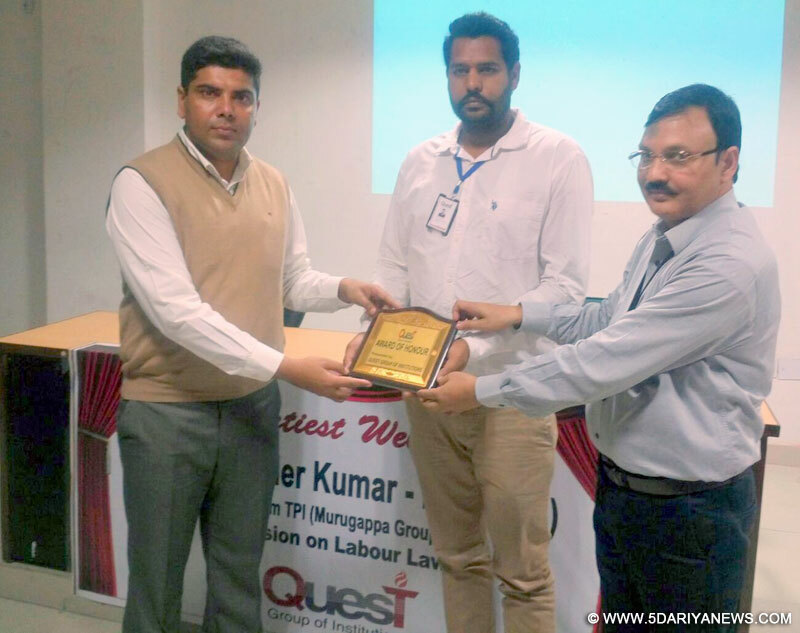 Quest Group of Institutions organized a guest lecture on Labour Laws for Management students. Surinder Kumar, DGM HR, Murugappa Group was key note speaker at the moment and conducted a very informative session on various labour acts and their implications in present day industrial environment. Students got to know about the Structure of labour industry and rights of labour enshrined in our law books to prevent them from exploitation and to uplift our labour class socially as well as economically. Surinder Kumar also shared information about Murugappa Group and various opportunities in Murugappa Group for MBA pass outs.D S Sekhon , Chairman of the institute said at the moment that such seminars provide vast knowledge about rights and duties as well .If students will know their rights only then no one will able to exploit them and they will achieve their dream goal & excel in their life .